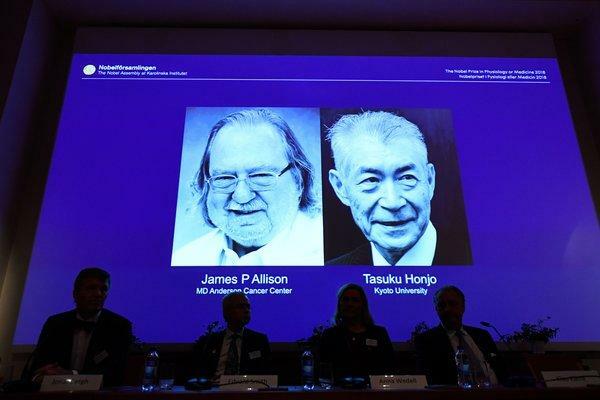 New York Times (Oct. 1, 2018): The Nobel Prize in Physiology or Medicine was awarded on Monday to James P. Allison of the United States and Tasuku Honjo of Japan for their work on unleashing the body’s immune system to attack cancer, a breakthrough that has led to an entirely new class of drugs and brought lasting remissions to many patients who had run out of options. The drugs based on their work belong to a class called checkpoint inhibitors, with tongue-twisting names that have nonetheless become familiar to many patients. The first ones approved were ipilimumab (brand name Yervoy), nivolumab (Opdivo) and pembrolizumab (Keytruda). Others have since come to market.